All recyclable materials can be placed in any campus recycling container, including office bins. Mixed paper – without bindings, rubber bands or paper clips; staples don't need to be removed. Bubble wrap, packing peanuts and air packets: Bring them to the Sustainability Resource Center for free reuse by others! Building materials: Call (858) 534-2930 from 7 a.m. to 4:30 p.m., weekdays. Keep all trash out of recycling containers. Flatten cans and plastic bottles whenever possible. Empty and flatten all cardboard boxes before placing them inside recycling containers. Do not leave boxes near bins, dumpsters or on loading docks. Note: Before purging paper files or generating large amounts of paper or beverage containers, contact the Facilities Management Customer Relations help desk, (858) 534-2930, at least 48 hours in advance to get a large temporary recycling container. Styrofoam packing peanuts, food clamshells, plates, cups, etc. Most offices have a lined trash bin and a smaller recycling bin. 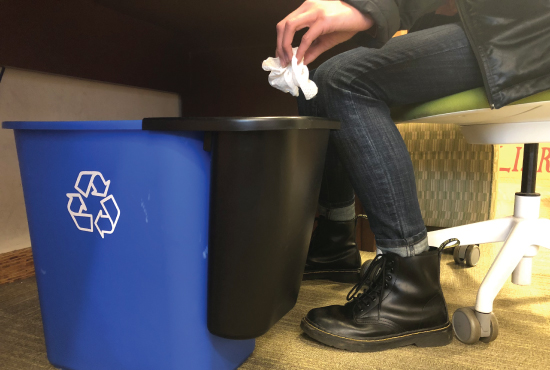 Facilities Management is transitioning all campus office trash containers to Bin Buddies without plastic liners and expects to complete the conversion by mid-2019. The new system will ensure that everyone has small trash bins and large recycling bins to save resources and money. Many campuses, including UC Berkeley, already use this system. Students living on campus can take batteries to their Residential Life Office or the Sustainability Resource Center for disposal. Placing them into an Intercampus Mail envelope labeled "used pens." For more information about recycling or to report problems, contact the Facilities Management Customer Relations help desk, (858) 534-2930, 7 a.m. – 4:30 p.m. weekdays.